April 3rd, 2016. PMRF, researchers meet to discuss possible effects of base’s activity on coral, other sea life. BARKING SANDS — Representatives from Kauai’s conservation community recently met with representatives from the Pacific Missile Range Facility to discuss concerns that electromagnetic radiation coming from the high-powered radar and antennas could be the cause of coral’s decline. 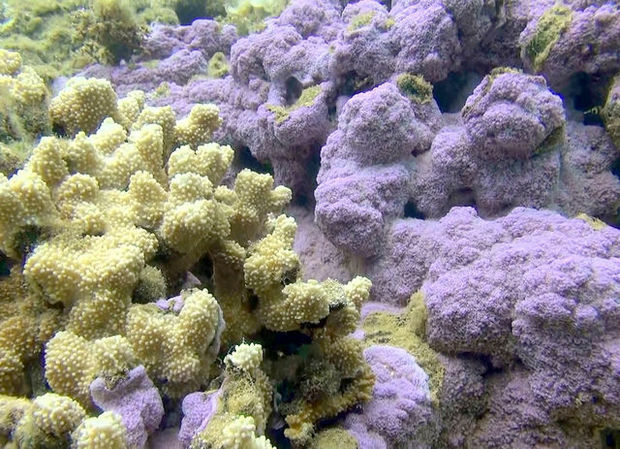 “I walked away from the meeting today with a good understanding of the path we can now take to study and understand why we are suffering a massive die-off of our coral reefs here in Kauai,” marine biologist Terry Lilley said Wednesday. Lilley has been documenting the decline of the coral reefs off Kauai since 2012, and is raising concerns about the military’s use of electromagnetic radiation and its effect on the reef. Stewart Simonson, an Atlanta-based senior chemical engineer who surveyed Kauai’s reef in 2014 and has been studying the area’s coral since then, said he thought the meeting was a step in the right direction. Both he and Lilley said further studies on the root cause of the reef’s disintegration are desperately needed, but they have a few ideas on the cause of the disappearing coral. After spending time underwater on Kauai and studying the reefs, Simonson’s theory is that the answer is accelerated corrosion — caused by an electrical current in the ocean. “In the industry, if someone asked me to do that, I’d need tanker trucks of hydrochloric acid in concentrated form to get that much to dissolve,” Simonson said. Corrosion, also known as oxidization or rusting, is a natural process, especially in the ocean. It’s one of the natural breakdown processes of nature and is well known to mariners, who will sometimes line their vessels with zinc to prevent corrosion of the boat’s metal. One of the easiest minerals to corrode is calcium, which is the main stuff of coral skeleton. Normal corrosion rates wouldn’t cause the current reef destruction, Simonson said, but accelerated corrosion would — and to get accelerated corrosion, you just need to add a jolt. “It only takes a very small amount of electrical current flowing in the atmosphere or in the water to speed up corrosion,” Simonson said. PMRF has about 20 radar towers on North Kauai. They work by bouncing electromagnetic radiation off of things — that’s how they detect objects. Electromagnetic radiation is composed of waves — just like light is, except that electromagnetic radiation isn’t visible to the human eye. According to scientific models, the radiation covers much of the northwest part of the island. A lot of the electromagnetic radiation is soaked up by the environment or dissipates into the atmosphere. When there’s cloud cover, most of it is reflected back to the Earth, saturating everything. “I think that when it gets absorbed in sea water, which is a good conductor, it goes to ground and I think it’s grounding out on the reef,” Simonson said. That low-level electrical current in the water breaks everything down, and it speeds corrosion up by hundreds of thousands of times, he said. Rim of the Pacific occurs biennially on even-numbered years in June and July in the waters around Hawaii and California. It is the world’s largest multi-national maritime exercise and has been happening every two years since 1971. RIMPAC lands 45 warships off the coast of Kauai, each with 50 to 100 antennas that pulse radar from the vessels, and all the electromagnetic radiation form those antennas compounds the native radiation. “When RIMPAC is in town, you have probably at least two times the amount of radiation coming off the warships as you do off the top of the mountain at PMRF,” Simonson said. 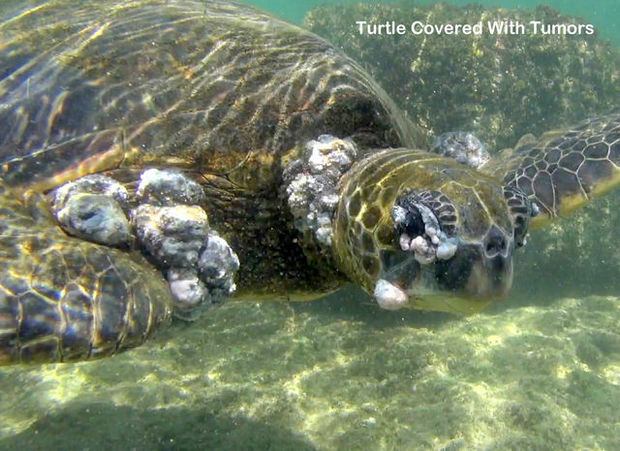 It’s not just the reefs that are suffering off the coast of Kauai. During the 2014 RIMPAC games, Lilley reported dead whales, sharks, turtles and other sea life. One turtle he found had all four of its fins badly mangled. Simonson’s electromagnetic radiation theory could explain this mystery as well. He said electromagnetic fields (EMF) produce electromagnetic radiation and trigger an electrical current near the surface of the salt water — which is usually a great conductor. The turtle “is poking his head up and floating around a bit near the surface and getting juiced a bit near the surface,” Simonson said. Animals are bioelectric beings, meaning electric processes within the cells is partly what keeps them alive. Too much electric potential can interfere with the body’s natural electrical processes and can damage DNA. When that’s replicated, it repeats the damage and creates a tumor. Simonson further theorizes that when it’s raining, the water’s conductivity drops near the surface and near lava tubes — making the path of least resistance a nearby turtle or other animal, instead of the water itself. “I think the chance of electric shock is the highest and that’s where Terry is seeing the highest disease rates,” Simonson said. Lilley said it’s much more difficult to show a connection between electromagnetic radiation and human disease than it is to document the effect on marine life because of the secrecy of medical records. Human biology uses the same bioelectric processes within cells to drive life and scientists theorize the effects of chronic exposure to high-powered electromagnetic radiation can cause tumors in human bodies, too. According to Lilley and Simonson, agreements were made between scientists and the representatives from PMRF to exchange information and work together to further study Kauai’s struggling coastal environment. Hay said he and his staff are open to future possibilities. “Additional positive benefit is yet to be determined, but certainly within the realm of possible,” Hay said. PMRF did not respond to numerous questions from TGI regarding concerns expressed in this story about military activities and their impacts on marine life. Healthy blue rice coral is seen off Anini Beach in 2013. 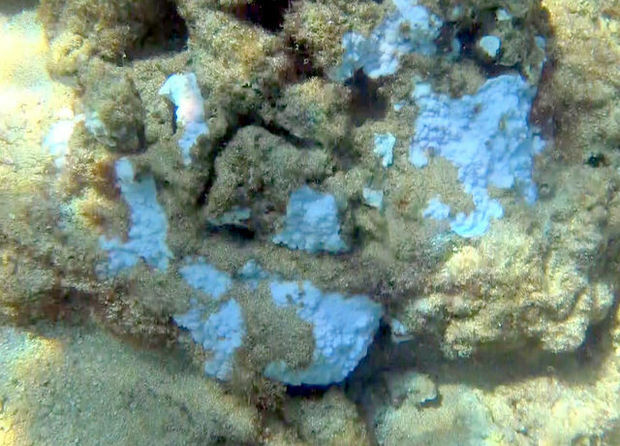 The same blue rice coral is seen off Anini Beach in 2014.